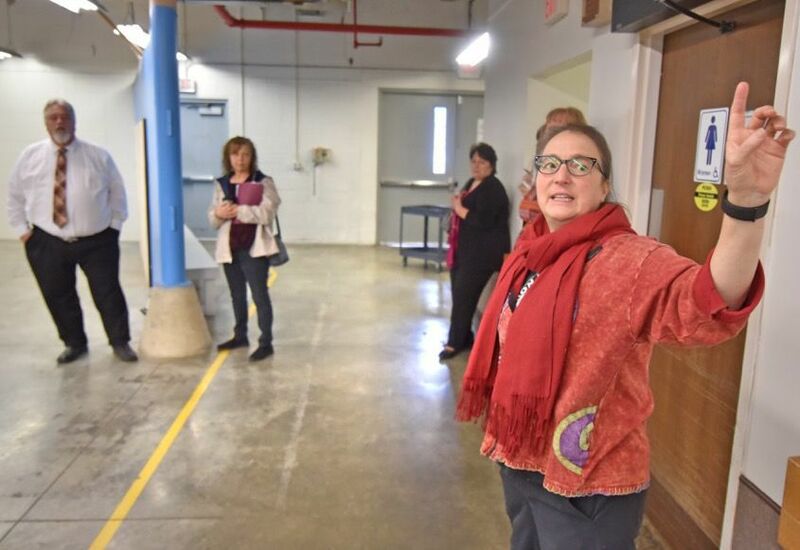 The former Atco sheltered workshop building on Campbell Street in Athens was toured Tuesday by the Athens County Commissioners as they try to figure out how space in the county-owned building will be utilized and by whom. On hand were Peggy Six, the clerk of the Athens County Records Center, and Patty Mitchell, founder of Passion Works Studio. Mitchell has asked for space in the building so Passion Works will have room to grow. Representatives of the Athens County Board of Elections toured the building earlier, and that board has asked to relocate its offices there. “We know the records center is coming here, the question is the other things,” said Commission President Lenny Eliason. Moving the elections board away from Court Street has faced some opposition and the commissioners have not yet voted to approve it. Also, action has not been taken on Passion Works’ request to lease space in the building. It is unclear when those decisions will be made. Passion Works Studio, which employs artists with developmental disabilities, got its start in the Atco building. Mitchell has asked the commissioners to allow Passion Works to use its former studio space for production and use the building’s loading dock area for shipping and receiving. If that is approved, Passion Works would still use its space downtown, Mitchell said. Mitchell said Passion Works wants to increase production and create more jobs for people with and without disabilities. 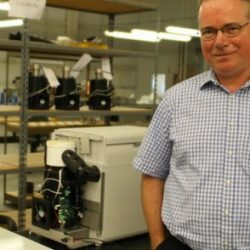 “In order to advance and double production, we need more (space),” Mitchell said. Commissioner Charlie Adkins said he doesn’t want the county to be in a position where the records center moves to the Atco building but then in a few years fills up its new location. Eliason said any lease with Passion Works would be for specific time period, perhaps five years, and the space could be recaptured for the records center if needed. The records center is located in the former Athens County Job and Family Services building at 184 N. Lancaster St., which the county wants to sell. One issue at the Atco building would be security. It might be necessary to build some walls or add doors so that the records center and the elections board office are inaccessible to each other or by anyone else using space in the building. There was discussion about building a cage around the records center. There is no specific timeline for moving the records center, and Eliason said it could take several months to prepare for and accomplish the move. Commissioner Chris Chmiel said he doesn’t think the county should address space issues piecemeal, but instead should have a plan the looks at all the options. He invited County Planner Jessie Powers to Tuesday’s tour of the Atco building.